Norton is a professor of business administration at Harvard Business School and co-author of Happy Money: The Science of Happier Spending with Elizabeth Dunn, a professor of psychology at the University of British Columbia. 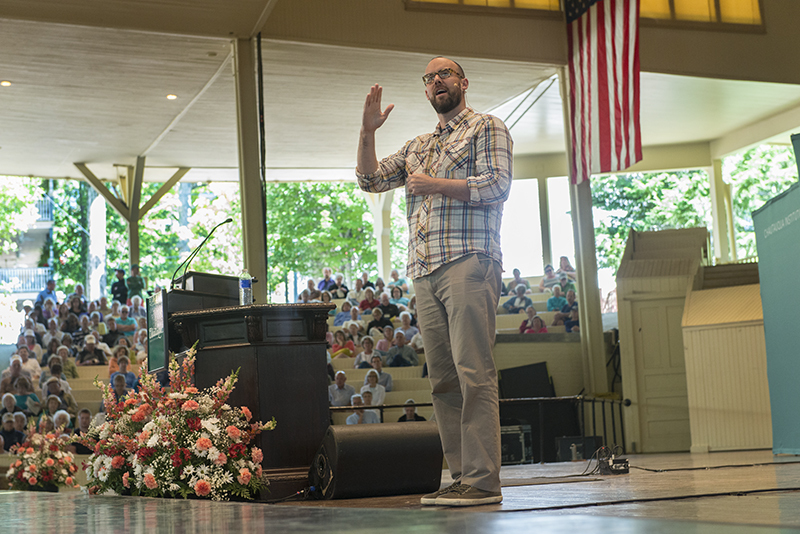 The duo spent 10 years poring over research to discover what really constituted “happy spending.” He related their findings on the lecture platform Wednesday morning in the Amphitheater. Much has to do with context, he said. For a person earning $20,000, an extra $10,000 can make a world of difference. A simple graph, ranking happiness from zero to 10 vertically and money from $0 to $1 million horizontally, shows that wealth stops having a dramatic effect at about $75,000. After that, Norton said, the correlation between money and happiness ends and becomes a straight line. On average, most people rank themselves on the vertical happiness scale between seven and nine. Research conducted on millionaires with wealth ranging from $1 million to as much as $50 million also ranked themselves on average between seven and nine on the happiness scale. Next, they asked their millionaire subjects how much more money they would need to become a perfect 10. Almost universally, the answer was three times more. And the answer was true of those millionaires who had actually accomplished the feat of tripling their wealth, whether it was from $1 to $3 million, from $3 to $9 million and so on. Norton cited lottery winners as an example of the adverse effect wealth can have on people. Many lose relationships with friends and even spouses over money. This alienates the most reliable source of happiness, which is human connection. In addition, poor financial planning and taxes leave many in debt, another huge detriment to cultivating happiness. Some pre-emptively leave their jobs as well, forgetting the sense of purpose and accomplishment it yields, he said. Many people who come into wealth have an instinct to buy things under the belief that purchases are permanent. Conversely, experiences are sometimes viewed as frivolous and fleeting. But Norton said it is far more worthwhile to buy experiences than material items. To illustrate, Norton said a $2,000 TV might be valuable as a status symbol and source of entertainment, but the waiting period is “irritating,” and the result is spending time alone in front of it. On the other hand, by spending money on a vacation, the reward isn’t simply the experience but the anticipation leading up to it. “The happiest moment of a vacation is the day before,” Norton said. Norton said social comparison is one of the hardest factors to overcome when it comes to happiness. It’s even harder with materials because there is always a new, better version around the corner. Experiences like vacations, on the other hand, are extremely hard to compare to others. Norton offered several tricks to the audience to use money in ways that are scientifically proven to increase happiness. One is to simply take a break. Liking something, by nature, drives people to do it more. However, the satisfaction from eating chocolate cake, for example, decreases significantly from the first slice to the seventh, Norton said. It is a part of human psychology called hedonic adaptation. In another case, binge-watching, the act of watching whole TV shows at once, eschews the network model of weekly intervals and commercial breaks. But those dreaded breaks, Norton claimed, were precisely what made TV so much more enjoyable. Another trick, aside from buying experiences, is to buy time. Buying a nice house in the suburbs comes with a separate challenge — a potential commute to the city. The sacrifice of time needs to be accounted for. On a list of people’s least favorite activities, commuting comes a close second to a dentist appointment, Norton said. How does one purchase enjoyable time? Pets are an option, Norton said. Some may reject the commitment, but much like the jobs of the lottery winners, the positives often outweigh the negatives. A dog, for instance, forces its owner to take it for exercise and to invest emotionally in another being. Both of these things increase overall happiness dramatically. He decried the common trend, enabled by credit cards, to “consume now and pay later” because it accumulates dreaded debt. Instead, he advised to “pay now and consume later,” such as pre-paying for a vacation. This increases the enjoyment of the experience because there is not a heavy cloud of a future payment cutting into one’s present happiness. Finally, Norton said charity is one of the most guaranteed ways to increase happiness through money. “People who spend on others are reliably happier,” Norton said. Beyond the act itself, the act of seeing the impact of one’s generosity is the biggest factor to increase the happiness behind the decision. “Breaks, experiences, time and giving are ways to get, what I say, ‘happiness bang for your buck,’ ” he said. Q: When you look at happiness, how do you factor in the temporary emotions people have around an illness, a diagnosis, a loss, when you ask will you participate in this study. Do you factor those sorts of characteristics into your work? A: When we think about huge negative life events, like the loss of a loved one, they have a huge impact on our well-being. One of the things we are working on now in a separate line of research is a lot of research on rituals. It turns out that when people lose a loved one — we’ve done lots of research and surveys — very often they engage in a ritual to honor that person. What’s interesting is that, often, it’s not a ritual like a religious service. When we ask them if they have performed any rituals, they say yes and tell us something very private that they did to honor that person’s loss. So, for example, one woman said that her husband had a sports car he loved, and he washed it every Sunday. When he passed away, she kept the car and washed it every Sunday to remember him. We saw so many people with wonderful stories of very specific rituals that were so meaningful to them that both remember the person and honor that they weren’t there anymore. What we find in our research is that these rituals help people get over the loss. One reason that they do that is because when we lose someone — in close relationships as well, if you get divorced or a relationship ends — of course we feel many negative emotions, but we feel a loss of control over our lives because this was someone we wanted and valued, and it’s gone and we feel a little bit out of control. The nice thing that rituals can do for us is, because they are ritualistic, they make sure we feel more in control of our lives. They make us feel like there is a pattern to our lives. They make us feel like we have some assertion over how we are going to honor their lives, and we do find that rituals help us get over our loss. Even though I focused on money and happiness today, there are so many fascinating researchers all over the world studying all of these domains of life, trying to understand when people have positive and negative events happen to them, what’s the psychology of those events and hopefully bringing some of our knowledge to bear, can we help people understand how to be happier, help people grieve less, and design interventions that will help people deal with these important life issues. Q: How much does happiness depend on your peer and community context? The questioner states the proposition that even very rich people feel poor and unhappy when they are compared to people who are five times richer. A: I would love to know if the person who asked that is richer than their neighbors or poorer than their neighbors. So the question is actually about relative income. There is very cool research about relative income. So think about it this way, you make $50,000 a year and you will in a neighborhood where everyone else makes $25,000 per year versus you make $50,000 per year, same salary, and you live in a neighborhood where everyone makes $100,000 per year. Now your life is technically the same. You make $50,000. You can do the same things. But it turns out people who live in a neighborhood where they are the richest are much happier than people who live in a neighborhood where they are the poorest. Much, much happier. It’s actually kind of a big effect. Why? Well, we talk about how they get the better TV than you. For whatever reason, those things really bug us. Social comparison is one of the hardest things we deal with. We are constantly looking around to see where we stand relative to other people. That absolutely can affect our happiness. One of the curses of this, by the way, is you know when you start to make more money and you start to move to a bigger house, well you are doing it to yourself. If you made the amount of money you made and stayed where you were, you’d be the rich person. You’d feel like a lord looking around at the common people, but it’s not what we do. We move to the neighborhood that is just barely in our price range. But we like to live there, so we put ourselves at the bottom again. So then we make more money and we move again, and we put ourselves at the bottom again. So oddly enough we are purposely making ourselves worse off in comparison instead of staying in a place where we like what we have, we like the people around us because we have lived there for awhile, and we can enjoy our money without comparisons. Q: Does inheriting money versus earning and saving money have an impact on happiness? A: That sounds like someone who has children. We do research with very wealthy individuals, and one of their biggest concerns in life is that their children will grow up to be jerks because they have everything and they can give their children everything. The worry is, of course, that they won’t have to struggle and strive to find that thing they are passionate about and, therefore, they won’t have the kind of rich life I’d like them to have. Of all the problems in the world, having too much money is never the one we feel worst about, but it’s a real concern for many parents, and we try to work on exactly this issue. In other words when we do struggle and strive and really have to beat ourselves up to get somewhere, we do enjoy the product of that even more. We know this actually because of a project that Dan and I did a number of years ago called the IKEA effect. So the IKEA effect is the idea that, when we make things ourselves, we come to vastly overvalue them. Some of you instantly thought of a mug you made or a terrible watercolor that you painted 30 years ago that is still on your wall. Others of you poked your partner because you are thinking of their terrible mug or watercolor that they made 30 years ago. But it turns out, in research, when we have people make things themselves, they really come to overvalue them. Why? Because it makes them feel like they are accomplishing something. Remember I said jobs are good because they make us feel like we are accomplishing something in the world. Well these little experiences also, when we make something with Legos, we have people fold origami. It turns out that when they fold the origami themselves, they see it as beautiful. Everyone else thinks it’s terrible, but you love it. Which means that when you create it for yourself, it’s a unique experience that you can take with you. We see the same thing at the macro level of earning your own salary and earning your own outcomes over time. We are happier when it is the fruits of our own labor. Q: You talked about the benefits of taking a break from TV for a while, for example. What do you think is the right frequency for somebody like you to travel and be out of the home during the week? If you were giving marital advice? A: Well, I think we are out of time. By the way, I mention you should take breaks from the things you like best and try other things. There’s one domain that is an exception to that. So there are these phrases like “absence makes the heart grow fonder,” and there’s truth to that, actually. When you’re with someone all the time, you start taking them for granted. When you’re away from them, when you’re missing someone, it’s not a positive emotion, but remember the excitement and anticipation of seeing them. When you are around them all day, you don’t get that waiting period, and you don’t get that “it’s going to be great tomorrow” excitement. You get “good” all the time, and it can be better to take a break and come back, and it can be great because you haven’t seen them in a while. However, my wife will tell you that I’ve taken it too far to an extreme. Thank for raising my personal issues on stage. Q: What is the impact of Twitter, the Internet and smartphones on happiness? A: So everyone is talking about how everyone is on their phones, and you don’t talk to anybody, and we keep looking at our phones, and it’s bad for us. There was this amazing picture that went around on Twitter awhile ago of a commuter train in New York in the 1930s. It was all men at the time going to work in the city, and they all had newspapers open so they couldn’t see the person next to them. We’ve always wanted to not have to chat with everyone around us. So, often times, new technology allows us to do it in a different way. But the impulse to be antisocial and look at something instead of opening ourselves up to the world, I think, is still there. The Internet has made it much easier not to have to wait for things. So in this sense, it’s harmed us a lot because we don’t have any of this anticipation anymore when we can get it right away. Now, we aren’t going to give it up because we like to get things right away, but technology tends to exacerbate some of the things that go on, but in the end we have the same psychology that we always had, so they tend to interact in the same way they had. Q: Does the money-happiness correlation change if you move backwards on the salary curve? A: I mainly talked about how we rise up, and our income goes up over time but our happiness stays the same. Here’s some other depressing news. Danny Kahneman, who won a Nobel Prize for his work with Amos Tversky, for this phrase “losses looms larger than gains.” This is a sad thing about human life. One increment of good doesn’t feel nearly as good as the same increment of bad feels bad. Which means that losses hurt as much than gains help us. As our income goes up, we really don’t see much of a change in our happiness, but decreases in income in fact do make us less happy. There is a bigger impact going down than going up. We actually looked at wellbeing data at every country in Europe over the last 20 years. It turns out that people in Europe aren’t getting any happier over time. The standard of living is going up, so you would think they would be getting happier. But here is what happens: There are periods of economic growth in Europe, and the people in the countries during that time get a little bit happier. But a little bit happier. But then, there is one year of recession, and because the bad is stronger than the good, it wipes all of it out. That has been happening over and over again. And we’ve seen the same thing in the U.S., actually. So one of the reasons we don’t see people getting happier over time is because one bad year can outweigh five good years, bringing us back to where we were in the beginning.